A recent report recently published by Transparency Market Research (TMR) presents a detailed and professional overview of the global metallic pigments market. The report, on the basis of qualitative and quantitative analysis of the market data gathered with the help of a number of primary and secondary research methodologies, projects that the global market for metallic pigments will expand at a healthy pace over the period between 2015 and 2023. 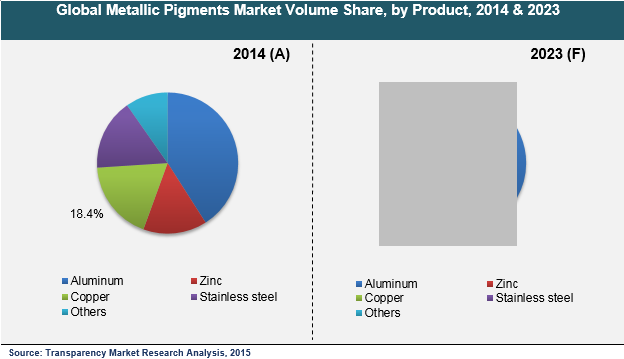 The report states that the market, which had a valuation of US$ 736.2 mn in 2014, will expand at a 6.4% CAGR and rise to US$1,286.7 mn by 2023.The report is titled “Metallic Pigments Market - Global Industry Analysis, Size, Share, Growth, Trends and Forecast 2015 - 2023”, and is available on the company website for sale. The report states that factors such as the rising demand for paints and coatings in the automotive sector and the flourishing plastics and printing inks industries in Asia Pacific are the key factors driving the global metallic pigments market. Metallic pigments not only possess the ability to enhance the visual quality of products, but also offer features such as ductility, opacity, and corrosion resistance to the end-product. Over the past few years, an increasing demand for metal paints, compared to solid paints, is also significantly propelling the global metallic pigments market. However, volatility in raw material prices of precious metals is expected to hamper the growth of the global metallic pigments market to a certain extent over the report’s forecast period.The report segments the global metallic pigments market on the basis of three criteria: product, end-user, and geography.On the basis of product type, the market is segmented into aluminum, copper, zinc, stainless steel, and others. On the basis of end-user, the market is segmented into paints and coatings, personal care, plastics, printing inks, and others. Geography-wise, the market is segmented into Asia Pacific, North America, Middle East and Africa, and Latin America. Based on product type, the market segment of aluminum accounted for the largest share of the global metallic pigments market in 2014. The market segment of copper held nearly 15% of the market in the same year. Copper, along with zinc, is used to give a typical gold bronze effect to products. Copper and zinc products are also used in numerous personal care products, printing inks, and paints and coatings.The end-use segment of paints and coatings accounted for the largest share of the global metallic pigments market while the segment of printing inks accounted for the second-largest share in the market in 2014. Over the report’s forecast period, the end-use segment of personal care is expected to grow at the fastest pace over the report’s forecast period. Geography-wise, Asia Pacific led the global metallic pigments market in 2014, accounting gpt over 30% of the global market. The market is projected to observe declining demand from the regional markets North America and Europe over the report’s forecast period owing to stringent environmental regulations.